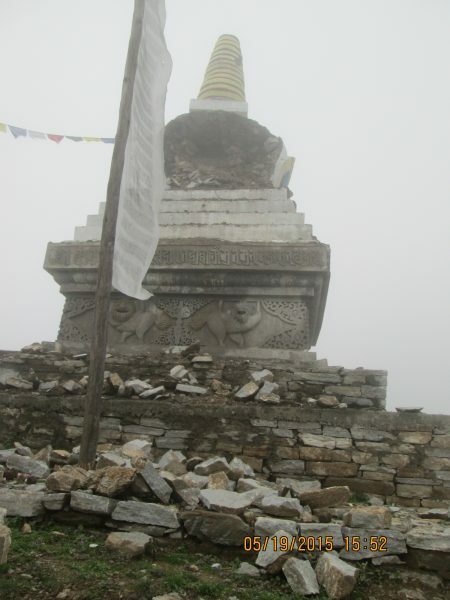 the epicentre was in the Gorkha district, west of Kathmandu. 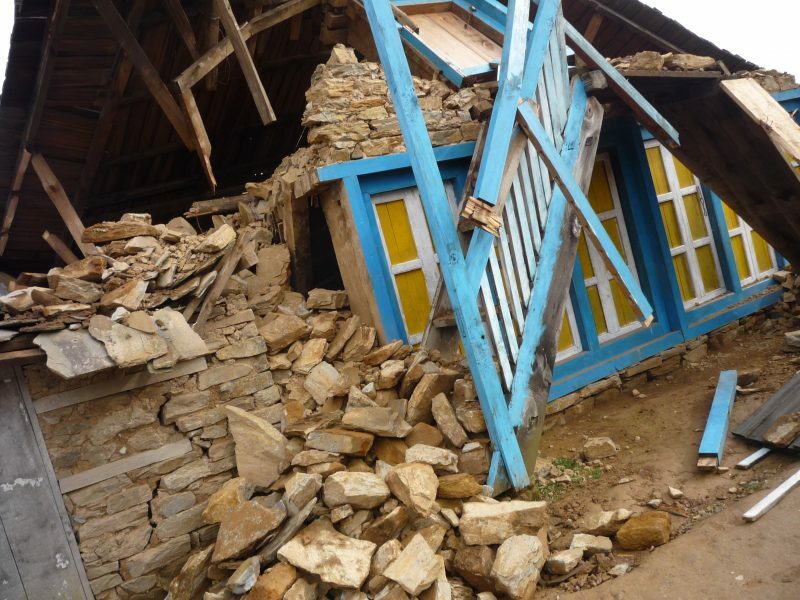 and the tremors were felt as far as about 2400 kilometres away. Since 2010 NAFA has assisted 11 villages in the general area of the lower Solu Khumbu and Okhaldunga, which includes some villages from nearby districts. These villages are spread wide apart and it takes about 16 days to walk through the area and visit all these communities. These villages are off the tourist trail and so there are no lodges or tea houses. Visitors to the area have to be self sufficient, taking tents, food, cooking equipment and employing guides, cooking staff and porters. 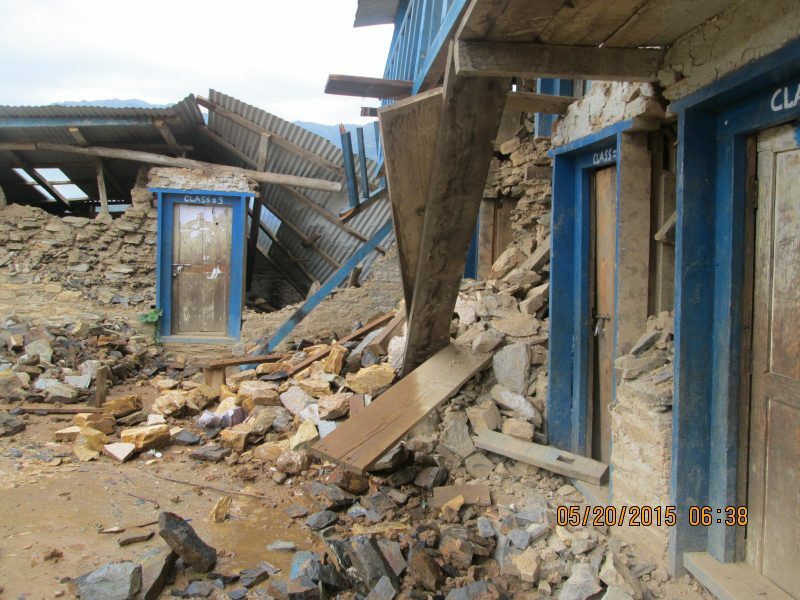 Communication has been sporadic, the details below listing the devastation in the area have been gathered from short phone calls between our Solu Khumbu representative and the different village representatives. 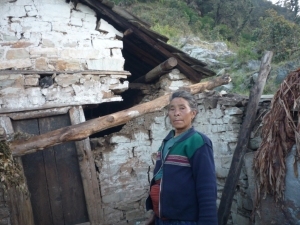 Shyama, a day’s walk from the roadhead village of Jiri – the school is at the top of a steep hill with approximately 230 homes scattered on and around the hill. NAFA has assisted this school to build three toilets, a school fence and renovated 4 classrooms. Unfortunately this block of classrooms has been damaged. Kophu and Gernipur are situated northeast of Phaplu airport in a valley. 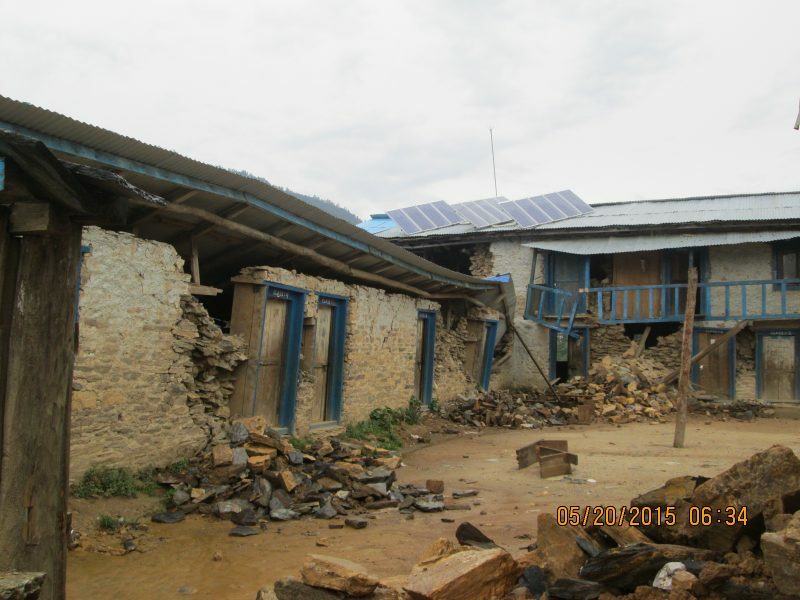 NAFA has provided funds in these two villages of 96 homes to build two classrooms, install 30 biogas systems and install 43 high altitude fuel efficient stoves. Eighteen homes have been destroyed. Mulkarka – NAFA has assisted this village with water infrastructure, fuel efficient stoves and a small water powered electric generator. Fortunately the electric generator is still functioning, some houses have cracks and two houses have collapsed. Lumsa is built on the side of a huge hill, the homes are scattered throughout this area. 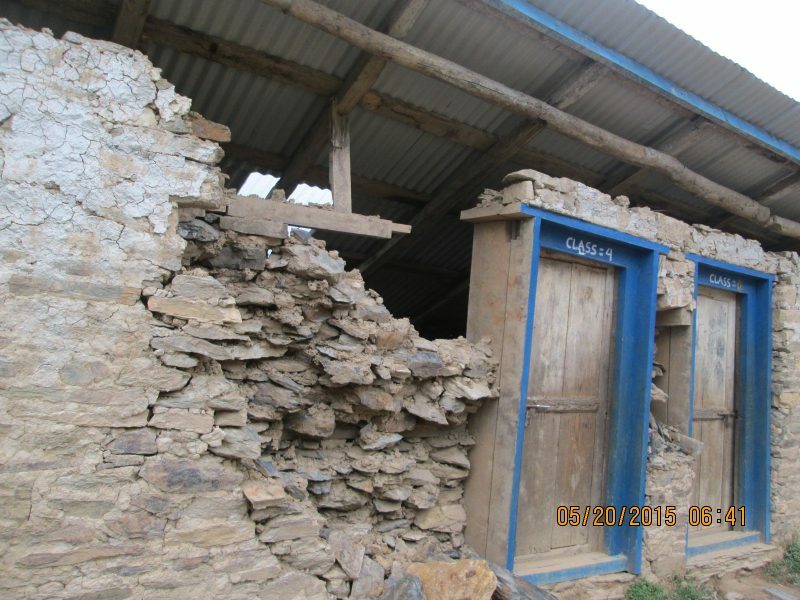 NAFA has helped this village with classroom equipment, fuel efficient stoves and a micro hydro electric plant. We understand the micro hydro – electric plant servicing 109 homes is still intact. 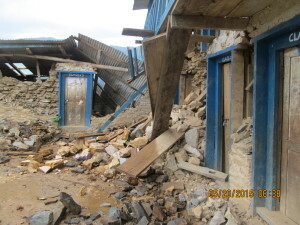 They have lost one block of classrooms and they have asked their German supporters to help them rebuild. 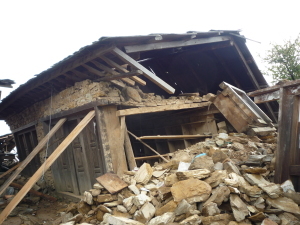 Eight homes have collapsed and eleven homes are too damaged for habitation. The newly built monastery has been destroyed. Juge and Dimel are situated on the southern side of Pikey Peak and further up the valley from Lumsa NAFA assisted this community of 57 homes with a micro hydro electric system which is still operating. Patle is another spread out community of 60 homes. 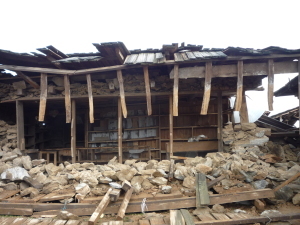 Last year, NAFA helped this village with the rebuilding of 4 classrooms, these are still standing but damages, the 4 government funded classrooms and the double storey 6 room building have also been damaged. Thirty homes in the area are uninhabitable. They want to continue to teach under shelter. 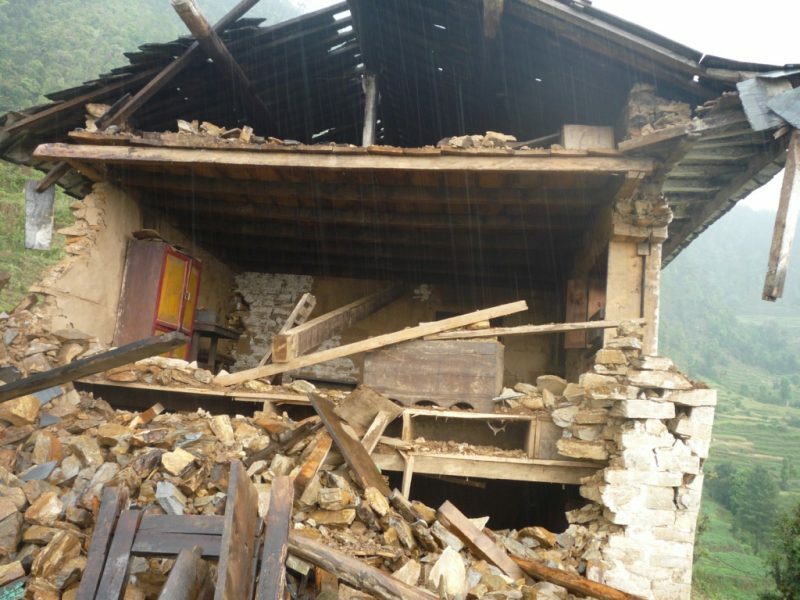 They have made a request for tin roofing, which they can then reuse when they rebuild, they will advise us of their needs in the near future. Terraces for crops were not badly damaged but there is a critical food shortage for some families, they were not able to salvage any of their basic food items from their collapsed homes. Some families have been living on boiled nettles and community donated food. The water supply,grinding mill and electric turbine which were installed in the village in 2013 have been damaged. Chermading has received assistance from NAFA with water infrastructure and the refurbishment of 7 classrooms in the school for 200 households from 5 villages. 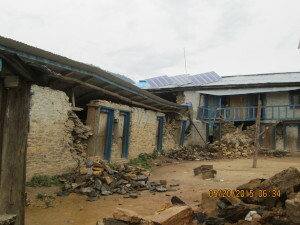 This block of classrooms has been destroyed along with another 2 classrooms as well as the double storey building with the teacher room, computer room and year 1. Fifteen homes in Chermading were destroyed. Dhupisurke has a small school consisting of 5 classrooms, recently NAFA assisted the school in refurbishing the classrooms with better floors and ceilings. We have been advised that the 3 classroom building has been severely damaged. Seventeen homes have been destroyed. 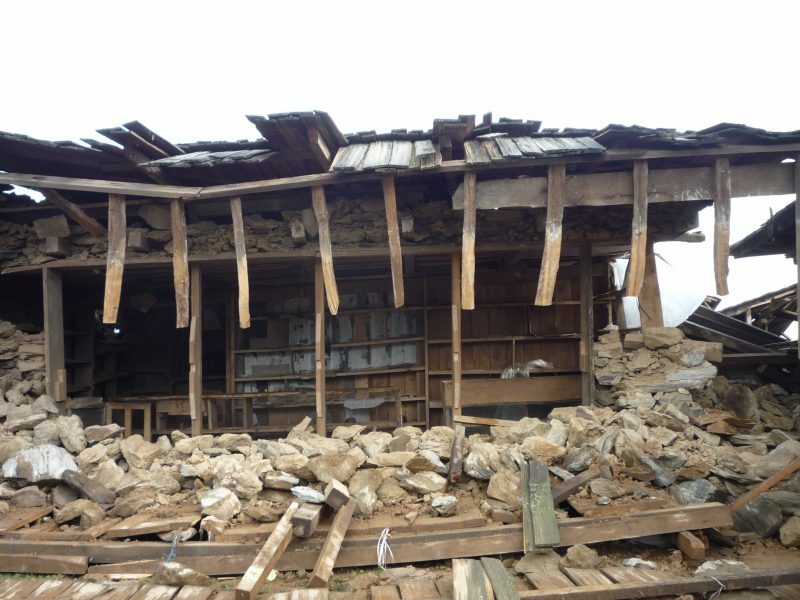 Due to the steep slopes surrounding their village,their farming terraces have also been badly damaged. 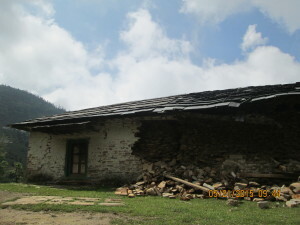 Jiri Karka is a small community where NAFA has assisted with water infrastructure to the village and a grinding mill. The water infrastructure is intact but six homes are uninhabitable. Kin Gording Monastery situated between the villages of Chermading and Dhupisurke has been completely destroyed along with many of the monks shacks surrounding the monastery. Many monks residing there lost their lives. We wont know the full extent of the damage to the classrooms and other infrastructure until we visit the area in late 2015. Prepared by Ross and Brenda Hazelwood with information received from Phurba Sherpa representative for the Solu Khumbu and Okhaldhunga area.